As much as this pains those who have participated in the anarchist communist experience between 2011 and 2014 in the Canadian prairies, today, Prairie Struggle announces its official secession and subsequent disbandment. To this day, Prairie Struggle was the only specific platformist organization in the Canadians prairies. Though some may recall the existence of an anarchist communist group in Regina affiliated to the ACF (Anarchist Communist Federation of North America) in the 80’s, organized anarchism in the prairies has had many difficulties, some of which the Prairie Struggle Project has failed to overcome. Despite its downfall, Prairie Struggle, for one last time, offers a look into the organization, its failures and its small victories. Looking at the prairies since the end of the 80's, the majority of what was left of the anarchist movement had directed its energy in building counter culture movements and replacing mass based organizing with lifestyle and personal politics. The traditional areas of agitation and organizing like unions, social movements, communities and the work place had been abandoned and in some cases condemned creating a void where the future NDP in the prairies would prosper. The organizational culture that brought workers so many victories in the past and for which the prairies have abundance in historical examples, had been left behind in the face of movements focusing on identity. In the early 2000’s, a wave of radical left politics was sweeping into Canada. Despite this, one would be hard pressed to find examples of such resurgence in the prairies. Although, the prairies have always had some sort of constant in radical left politics through the IWW in Edmonton and Winnipeg along with a multiplication of anarchist collectives, co-ops and splintered groups, radicals find themselves confined to the four walls that close in their scene. Prairie Struggle certainly considered some elements of these politics as vital to the struggle. However, we hold today, that they cannot be the sole focus of a movement. Speaking specifically of the anarchist movement, which used to pose some form of organized resistance to capitalism; in some areas, this has been reduced to no more then a counter-culture, ideologically structured around images of grenades, molotovs, and past insurrections. The project began in autumn of 2011. From the beginning, being influenced by other Canadian Revolutionary Anarchist groups such as Common Cause, North Eastern Federation Of Anarchist Communists (who would eventually become l’Union Communist Libertaire in Canada), along with multiple other groups abroad involved in the Anarkismo Network, Prairie Struggle, although in vain, set out to build a mass revolutionary anarchist organization in the Canadian prairies. The members who composed the core founding group numbered five; an ex-NEFAC member, an ex-Common Cause supporter along with a student activist and two Prairie Anti-Capitalist Reading group members. Inhabited by the feeling that anarchism in the prairies had become profoundly influenced by Bourgeois ideology, turning its back on Class Struggle to manifest itself as “Lifestyle Anarchism”, it is no surprise that these anarchists gravitated towards Class Struggle Anarchism (libertarian Socialism, Anarchism Communism and anarchist syndicalism). Facing a situation of complete disorganization and bastardization of anarchism in the prairies (specifically Saskatchewan), these militants incorporated platformism into their core group in order to steer, in a common direction, their efforts. After a few months of discussion and debate, Prairie Struggle announced their existence in winter of 2011. The major focus of the group at first was to network with what was left of class struggle anarchism. From the very beginning there was this feeling within the core group that in order to grow in the prairies, they would have to build a revolutionary organization with a common ideology and structure. This strategy was based on the principle of “if we build it, they will come” which for most members felt like the only possible solution to break the isolation of the local geography. Although this model did rally individuals isolated in Winnipeg, Edmonton and various rural towns, this particular strategy never had traction outside militant circles of already convinced anarchists who felt isolated just as members of Prairie Struggle felt isolated before its creation. Far from building a mass anarchist organization composed of the working class, we were content with building a base of core collectives in the eventuality that these collectives would organize locally, and grow through the struggles they participated in. In the first year, PSO’s efforts where put towards traveling to various anarchist book fairs and events. PSO put thousands of kilometers on their vehicles during 8h+ drives every month or so to various cities in the prairies. The strategy at first was to appear like the only possible, well-equipped alternative to the current state of disarray the movement faced. Countless debates with primitivists and insurrectionists took place during these excursions, which in hindsight proved to be a spectacular waste of time. At the beginning of 2012, a General Strike in Quebec was launched by l’ASSE and their allies against a hike in tuition fees. Naturally, this created waves of support, as well as opportunities for PSO to mobilize. Having been in the process of discussing involvement within Unions and the labour movement, PSO, which was sympathetic to Combative Unionism, decided to lead local solidarity in Regina. For 2+ months, PSO organized ‘pots and pans’ solidarity rallies, conferences and poster campaigns in Regina which at first where very successful, but eventually fizzled out in due course. After a short assessment of PSO’s actions in support of the Quebec student strike, PSO focused on theoretical development in order to produce a position paper on a specific strategy in regards to labour unions. Although from the outsiders view this would seem a narrow and specific subject to cover even before discussing and developing a general strategy in regards to local agitation, it was natural for its members to gravitate towards such theoretical development due in part to some members being ex-student activists within the CFS and l’ASSE, while others were leaders in their union. The sentiment was that anarchism, although having a rich history of radicalizing social and labour movements, had moved away from such revolutionary activity, going as far as labeling any involvement in and around labour as reformist. With the coming of summer, the student Strike reanimated the debate among activists in the west of Canada. Aside from accounts produced by IWW Edmonton comrades, and one PSO member who had been involved to some extent in the struggle in Quebec, most information that circulated about the strike and the movement was either misinterpreted or misleading at best. After informal discussions with members of the various anarchist groups in Canada along with various IWW branches, PSO launched a cross Canada speaking tour on the Quebec student movement and Combative Unionism in September 2012. Using Jerome Raza’s testimony and knowledge of the movement to shed some light of how the movement came to be, and what really went on; and with the collaboration of Prairie Struggle, Union Communist Libertaire, Common Cause and the IWW, the PSO delegation visited 16 cities making 18 presentations in 13 days, from Quebec to British Columbia. During the winter of 2013, PSO set about writing and debating their first position paper, which after the speaking tour became focused on the subject of combative unionism. During the spring, it was released online creating much needed debate and criticism within the anarchist circles. Again through out the summer, PSO continued the theoretical development in regards to this strategy and released a Clarification to the position paper, which clarified the common misinterpretations and debated the value of the strategy further. Also that year, PSO released its first newspaper, Iron Column. At around the same time, Prairie Struggle Organization was undergoing structural changes. After 2 years of trying to build up a federation in the prairies, involving multiple discussions with a group in Edmonton and In Brandon, which for some time were going nowhere, PSO had considered giving up on the idea of a Prairie Specific federation to opt for proposing to integrate into Common Cause. This was rejected by its membership for reasons that are still vague but most likely due to geography. After more discussions in the spring with a Brandon Group, PSO grew to 2 collectives with a total membership of 10 members/supporters (double-digits baby!!!). Autumn 2013 was marked by initiatives to restructure and change focus from Regina to the Prairies. With multiple positions being filled, inactivity and lack of direction made PSO what it is today, a few collectives of individuals meeting and chatting sporadically, producing unfocused discussion on theory and action. An attempt had been made during a congress in early 2014 to give direction and structure to Prairie Struggle through online message boards, a new constitution and common campaigns, which are obviously now abandoned. Since the beginning, Prairie Struggle was focused around two principle aims which where set by its founding members. The first was to facilitate what felt like a much-needed debate around the identity of anarchism in the prairies. This helped us to establish that although PSO wanted to initiate the battle of Ideas within what was left of the movement against what it saw as Capitalism's manifestation within the movement through post modernism and identitarianism, it too fell victim to the very thing its was attacking. Prairie Struggle, instead of devoting its time and effort to establishing relationships and practices within the broader working class in movement (those who would be receptive to a combative, democratic, autonomous and class oriented ideology) engaged in a counter-productive activity-- debating with reactionary forces who had already rejected the class struggle nature and history of the movement. We could only establish our aims, principles and ideological orientation so many times before we simply reduced ourselves to a broken record and became identity driven instead of involving Prairie Struggle within the working class or help establish the social movements of tomorrow. Build it Big, Build it fast! The Second principle aim was to establish early on, a “network” or federation of what was left of the class struggle anarchist movement in the prairies. Much traction and interest was generated when PSO released its first communiqué entitled “The creation of Prairie Struggle Organization, its politics and its goals.” Members along with supporters would repeat meaningless phases such as “if we build it, they will come”, completely dismissing the meaning of the word “build” and believing that building a federation was as simple as setting up the structure, the ideology, etc… without realizing that without a working class, invigorated by social movements, through struggle, will radicalize and eventually constitute the base from which a revolutionary federation draws its strength. Modeling PSO’s future structure on a federation model, and setting this as its primary goal greatly reduced its audience to a militant ghetto at a vital and early stage of building. Prairie Struggle would have greatly benefited from a Cadre Model organization, which would of helped focus the group around tactical and theoretical unity translating to quality before quantity. This aim, although irrational in the current conditions, should not be rejected “en block”. We drew inspiration for our goals from various mass revolutionary organizations of the past along with platformist organizations of today such as the WSM and The Zabalaza Anarchist Communist Front. We must establish the conditions to bring such aims and goals to fruition. Practice, along with our ability to adapt to our surroundings such as the inhospitable prairies, is what constitutes a revolutionary practice and identity, meaning that the platformist identity is more then words set in stone or a specific line to walk. With the aforementioned actions forming the bulk of Prairie Struggle’s work, our structure became hyper-horizontal while most of the organization rested on the work, which was being done and coordinated by the traditional few. When new members joined, political training should have become a priority. Instead, the active individuals who routinely picked up the slack contented themselves with transferring secretary positions to untrained new members. They in turn, due to lack of knowledge and organizational development, abandoned their secretariats and duties. The lack of political training among new members led to the general desire to have results in the short term. Political training and formation are key elements to any revolutionary organization and should be fundamental to any continuity. Moving away from a federal model, towards a Cadre concept, from collectives, towards a “federation of individuals” with secretariats would have simplified and reduced the work needed to effectively oil the machine, leaving more time to dedicate to development of new members and intervention among our class. Three years of activity have taught us that nothing is built out of thin air, despite receiving applause by comrades at home and abroad for trying to do so. The explanation for Prairie Struggle’s death cannot be reduced to one element such as “loss of momentum” or “loss of key active members”. Although it would be easy to do so, it stems from the moment we planted our seed, watered the soil and worked the land. Some comrades who have come and gone look at Prairie Struggle's history with discouragement, but here we see prairie anarchists striving to develop a practice under class struggle lines with the past three years being rich in lessons for the future. This disbandment reads as a mea culpa, which it is not. The members of Prairie Struggle still carry forward their anarchist-communist beliefs, and we all still hold that the left incorrectly clings to an anarchist stereotype that places us in alliance with identity activists. How this statement should read is that our strategy was misguided from the outset, focusing on rallying those people doing any kind of work (including identity activists), instead of organizing the unorganized; a far more difficult task. We might identify as revolutionaries, anti-capitalists, anarchists, [insert label here]'ists; however, we are complicit in the capitalist system no matter how many dumpsters are liberated, nor how well you have the theory down pat. The sheer fact is that in part we are all still forced to co-exist within the capitalist system. Our existence is in no way independent of capitalism, and we all interact with that system on a daily basis. Our political ideologies compete in relation to capitalism, and capitalism frames our daily discourse. For the apolitical, apathetic, and other ideological liberals, this existence is compounded by the cultural mythos that capitalism is the only 'correct' system that can function. With an objective lens, anarchists and others within the left are a minority that actively holds capitalism as being wrong, even if a vast majority of workers out there acknowledge there is something "fucked up". While these pockets might have an ear for anti-capitalist thoughts, radicals have failed to transform them into meaningful support. Capitalism is a lifeway in North America; strategically, this puts radicals at the bottom of a large hill from the start. This should be a no-brainer.... So why are so many radicals failing? Organizing in a political capacity is a lot like door-to-door meat sales. Nobody wants to talk to you, nobody greets you without preconceived baggage, and the fact that you are participating in the activity through non-traditional forums means a certain level of skepticism at the get-go. This is the significant barrier we face, and we think we are failing to organize past it. Our answer thus far has been that radicals should concentrate on organizing the marginalized and organized... we sell meat to those that already enjoy door-to-door meat sales; but now, let’s piss people off. We don't entirely oppose what we have labeled as lifestyle initiatives. Bike collectives, community gardens, recycling drives, and other collectives of individuals have ideals that aim to undermine capitalism. The lesson we've learned however, is that these should be based on a set of politics, and not be the politics. These activities are framed as counter-culture but should be in fact framed by our own relations within the capitalist system. To us, these somewhat hokey initiatives can be a vast waste of time because we are privileged in being able to afford such time for these activities. They seldom address the needs of specific communities that would depend on them for their existence; and therefore do not fill a void left by capitalism, or create dual-power but instead create a void of relevant radical politics within the working class. When these initiatives fail to meet the needs of a community, they inadvertently stand in contrast with the community and consequently alienate the politics attached to these projects. To make an unsubstantiated observation: the majority of the working class in North America agrees with us. Like the majority of the working class, we struggle to associate with the contemporary radicals. Anarchist book fairs should be more appropriately renamed Anarchist bake sales, and these counter-cultural activities seriously interfere with our online guild's raid time. The point is that we are no longer deploying our resources and time to attend activities that are not meaningfully relevant to the people we work, live, and coexist with. We will surely not be attending when even bringing up this line of debate segregates us into the category labeled sectarian; our dedication to opposing body odour is inflexible and unrelenting. Thus, at this point, we will admit (with tongue in cheek) that we are the assholes that judge people for putting so much energy into their bicycles, gardens, zines, and liberated foods while they ignore or reject unions, shop floors, communities and schools as forums to organize within. We think some of them might miss the point of this whole ideology. Our goal is to organize people towards alternatives, not organize alternatives in hopes that people join them. While we propose waging class war within our society, this war is waged where workers live, work, and organize themselves, not on the margins of the above. In conclusion, building autonomous, combative, and democratic strategies within the mainstream is what organizes those within the mainstream, not a radical alternative that is run in a dank basement which appeals only to us, our friends, and orgies of the discontent. 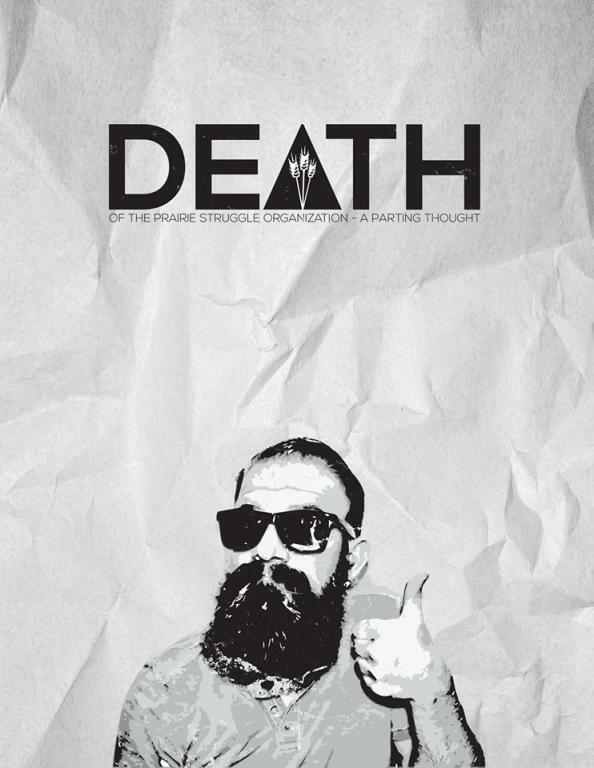 Although we all still endorse anarchist ideals, and the platformist stance within the movement, Prairie Struggle's disbandment is a readjustment of our sights from within the contemporary anarchist movement in North America, to redirect it towards the working class in movement. If this statement means alienation from some who claim to share anarchist ideals, so that we can favor organizing with workers on a common ground towards meaningful radical politics, we gladly embrace this sentence and anticipate moving forward with adapted strategies and new format. Prairie Struggle, at the very least, provided valuable insights into why movements fail regardless of how many resources are poured into them. This is instrumental for the decisions to come. Sorry to learn of PSO demise. I did a fast read of the statement, hope to slow the pace for a re-read. A couple of things popped out tho. functioning structures and developing the possibilities for all militants to be able to get elected and rotate into various positions of responsibility? Membership integration is tough, particularly when you want folks to basically be on the same page. I can tell you that WSA has not found the answer yet either. And I'm not sure reading 500 pages of cool texts is the way to go either. Yet "ideological development" is important and key. Over the years we have floundered with having members join actual working committees / commissions as a way towards both integration and practical work. We tried this when we first organized in 1984. Then again around 2010/11 as well. While an excellent idea, the gaps between concept and practice have been, shall we say, wide. "If this statement means alienation from some who claim to share anarchist ideals, so that we can favor organizing with workers on a common ground towards meaningful radical politics, we gladly embrace this sentence and anticipate moving forward with adapted strategies and new format. Prairie Struggle, at the very least, provided valuable insights into why movements fail regardless of how many resources are poured into them"
Please update as to what ex-PSO members are doing, have shifted towards and so forth. It was always my pleasure working with some of yo, even from a great distance.